“HCH is one of our key suppliers. 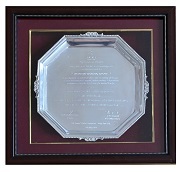 To receive this award, the supplier has to be very skilled in engineering and manufacturing, and be able to deliver a very high quality performance. It is expected that HCH’s high technology focus and knowledge brings value to Bajaj Auto and provides a great benefit to us when designing future motorcycle models. We can see a strong partner in HCH and look forward to growing together,” says, CEO, Bajaj Auto.